Founder of the SC “Borets”, Ievgeni Skirda, promotes idea, philosophy and vision of the Brazilian Jiu-Jitsu in Kropivnitskiy city (Ukraine). The “Borets”/ ZR Team sport club was founded in 2014 in Kropivnitskiy city. Before club’s opening, for several years, athletes were forced to rent different gyms and train there. “We started with trainings in the basement. We practiced together with my friend, whom I know from judo classes. We watched first UFC tournaments with Royce Gracie performance. I remember I was so impressed by his techniques with weight not more than 70 kg. He defeated all his opponents with the help of painful and suffocating moves. And even when he was lying on the floor, opponent tried in vain to beat him from above. So, basically this is how we discover the Brazilian Jiu-Jitsu world”, - shared Ievgeni Skirda. “I have been trained in Rio De Janeiro for several months, as well as in Hungary. In general, I tried to get as much knowledges as I could from the best masters from all over the world. For me jiu-jitsu is a lifestyle. And to say the truth I don't make money on it, but I spend money on my club”. In 2008 Ievgen Skyrda lived in Moscow for some time. There he got acquainted with mixed martial arts. Ievgen learned about KUDO, combat sambo and got to know about Gracie family and Brazilian Jiu-Jitsu. Coming back to Kropivnitskiy city, Ievgen wanted to continue his trainings but unfortunately there were nothing similar to such sport at that time in his city. Thus, Ievgen along with his friend were forced to practice on their own with the help of DVD-disks, and information from the internet resources. Ievgen realized that independent trainings are ineffective and offered his judo coach to open section of Combat Sambo. But almost at the very beginning of this practice Ievgen received serious knee injury and had to leave sport for more than 2 years. In 2011, after serious surgery and recovery period Ievgen Skyrda has returned to sport and for two years gradually coached with his good friend Anatoliy Tkachenko. In 2012, Ievgen Skyrda went to Kiev in order to attend Brazilian jiu-jitsu training classes. Sometime later Skyrda decided to join the Gracie Barra Kiev Club. 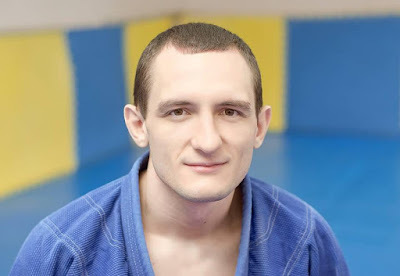 Since that time, future founder of the “Borets”/ ZR Team Kropivnitskiy sport club learned all basic principles of Brazilian jiu-jitsu and came to the conclusion that he has finally found his life passion. In January 2013, Artem Sidorov, President of Brazilian Jiu-Jitsu Federation of Ukraine conducted seminar in Kropivnitskiy city. Ievgen Skyrda visited it and after that founded a section of Brazilian Jiu-Jitsu in his native city. It decided to concentrate all forces on the development of this sport in Kropivnitskiy city. In 2014 Skyrda together with his friend Oleg Poloziy have founded “Borets”/ ZR Team Kropivnitskiy sport club. Oleg was responsible for freestyle wrestling trainings in the club. Now he immigrated to Spain, where he continues to work as a freestyle wrestling trainer. In 2015 the second gym of “Borets” club was opened. It has summer terrace and modern wrestling room, accommodation for athletes, sauna and massage cabinets. Ievgen is not going to rest on his laurels, as there is no limit to perfection. Currently, Ievgen successfully promotes BJJ in Kropivnitskiy city, opens new training clubs, and prepare champions for world tournaments. "Professional sportsman must always stay calm and be able to accept any scenario of the fight. Because both victory and defeat are only parts of the path to success and highest performance”, says Ievgen Skirda. Does Jiu-Jitsu Make Us Better People? Why Do People Quit Jiu-Jitsu?